Linda Kenyon is a Canadian writer who lives year-round with her husband Chris Hatton on one boat or another—either their 43-foot steel sailboat, often in the Bahamas, or the boat they built in a meadow on their farm south of Owen Sound, Ontario. 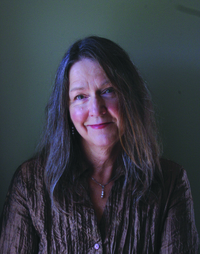 Stories about their sailing adventures appear regularly in magazines, and Linda has had many short stories published in Canadian literary journals. She has written two books of flash fiction, You Are Here and This is a love song, sort of, as well as a book of nonfiction, Rainforest Bird Rescue: Changing the future for endangered wildlife, which won a Science in Society Journalism Award from the Canadian Science Writers Association. Before retiring to sail and write full-time, Linda was a communications Linda Kenyon is a Canadian writer who lives year-round with her husband Chris Hatton on one boat or another—either their 43-foot steel sailboat, often in the Bahamas, or the boat they built in a meadow on their farm south of Owen Sound, Ontario. Linda Kenyon hasn't written any blog posts yet. We’d love your help. Let us know what’s wrong with this preview of If, Then by Kate Hope Day. We’d love your help. Let us know what’s wrong with this preview of Beautiful Scars by Tom Wilson.